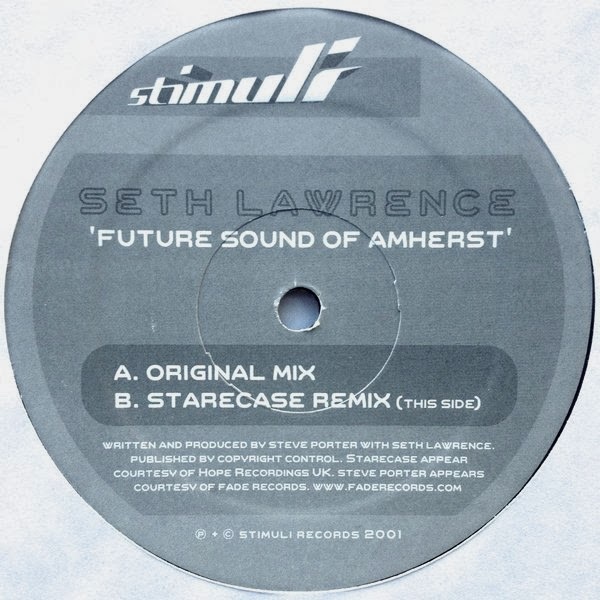 And This Is What You Get When You Least Expect It: Seth Lawrence - Future Sound of Amherst 12"
Seth Lawrence - Future Sound of Amherst 12"
This is the 2001 Stimuli Records 12" for the track by American producers Seth Lawrence and Steve Porter. The A side original mix is a straightforward progressive house cut with clean patterns, crisp percussion and a feathery arpeggio that creates forward sonic motion. The production value is similar to other SP works and carries the hallmark sounds that propelled him into the international dance music spotlight. The B side is a thundering remix by Bristol UK producers Starecase. Their remix adds multiply layers of sounds and reinterprets the basic structure into something that is greater than the original version. This mix is one of the best works to appear on the short lived label, and sadly the last. Both mixes are here for your listening pleasure. link on my blog is now updated. I bought this record few days ago, and it spins on my turntable right now. and, Man! what a 12" this is! Steve Porter style on one side, and Starecase style on other - you can't have more prog greatness on one plate, from that time. Great upload, I don't need to rip my own vinyl. Thanks B.Dee, keep it up!